come take up residence and thrive. The reader is left speculating as to why the birds don’t use the bird box. Is it because it’s in the wrong place, made the wrong shape or with the wrong materials, leaves any residents vulnerable to predators or because the box is a mark of human desperation? When the human homeless crisis is too big for one person to solve, humans use an open home for birds to salve their consciences and, although the birds can be freely observed, whoever put the bird box up hadn’t taken time to watch and understand the birds they thought they might help. worth is self-evident: be confident. A simple poem about lilies becomes anthropomorphism, offering affirmative advice that could be repackaged as a social media meme. In the end I found I liked the ideas behind the poems more than the poems themselves. It was noticeable that there were no acknowledgements or publishing credits in the collection. 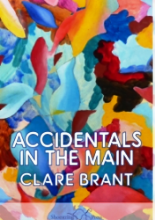 Overall Accidentals in the Main is an interesting, thought-provoking read; however, there’s not quite enough to reward going back to re-reading the poems.